I’ve done the massive German road trip through Bavaria and gone to a few of the major cities. Of all the countries in Europe that are the easiest to navigate and the friendliest, I’d say Germany is at the top of my list. So when the opportunity to travel back for a Hamburg music festival arose, I jumped at the chance to explore more of Germany, especially up north. You can find flights straight from NYC to Hamburg on United, or other major US to cities to nearby German cities. Want to know exactly how to spend some time in this plucky, artsy and fascinating city? Let’s do this. Of all the music festivals I’ve enjoyed worldwide, it’s officially decided – Germany throws the best ones. MS Dockville in late summer is a laid-back gathering of dozens of international acts, ranging from hip-hop and folk to DJ sets and house. You can walk through the art installations and check out some of the local talent, then savor some German delicacies at the food trucks located almost everywhere. Feel free to dress-up Coachella-style, but it seems in Germany more people opt to take things casually, jeans-and-sneaker-style. My favorite acts this year were Zhu and Bonobo. It’s a little bit of a hike to get to the main gates of MS Dockville, so plan on a taxi or rideshare. There’s no Uber in Germany, so you’ll have to go for MyTaxi or flag someone down. There is also a free shuttle from the grounds to the main bus and train terminal nearby. It’s a 20-minute ride from there but, of course, can be packed at certain times during the day. Plan ahead and you’ll be fine. BRING CASH – this fest only accepts cash, as do some other spots in Hamburg. It’s good to be prepared. There are a couple of ATMs on site but not many. Plan your transport to and from the festival ahead of time – ask the hotel front desk if unsure. MS Dockville will go all night. If you’re used to American festivals ending around midnight, be prepared for late-night sets and parties that rage until the sun goes down. Hamburg music festivals are an all-day and all-night event! Layer clothes – hot during the day, cool at night. Bags are allowed, liquids are not. People seem to have a few drinks before going through the gates – there’s a long walkway lined with bikes where friends gathered before the shows. Use the MS Dockville app to check out which bands are at which stage throughout the day. It’s in German but the times and stages are clear. 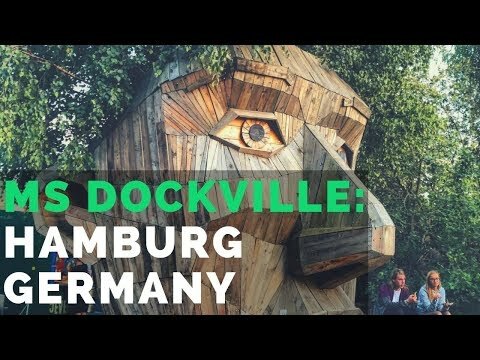 A little video preview of Dockville below! My base for the trip was the Superbude Hotel in St. Pauli. While billed as a hostel, the property has plenty of private rooms with an en suite bathroom that are chic, minimalist and perfect for even discerning travelers. There are several floors of rooms without any noise pollution and cheery views of the city below. Not to mention, this is an ideal situation when you’re attending a Hamburg music festival and are a bit older – I need my eight hours of peaceful sleep so I can hang! I also appreciate the late breakfast hours and quiet, co-working-friendly lobby areas. From Superbude, you can step right outside the door and get a glimpse of St. Pauli’s signature look – every inch of the neighborhood covered in street art. It’s part of the look now, and there are actually laws in place so even graffiti-style tags are not to be removed. You can take a guided tour to make sure the good murals and pieces are not missed, especially between the Hamburg Messe (Hamburg Fair) and Heiligengeistfeld. Most of this area is populated by startup companies, cafes, and parks. Take a break at Altes Mädchen (beer hall) for a cold local pint al fresco. German good in Bavaria was slightly diverse but leaned toward hearty meats and breads. Don’t worry – I got my starchy spätzle as a wonderful street food dish during MS Dockville to soak up the beer-fueled dancing. I was delighted to discover that Hamburg did not follow this trend and instead, offered an international spread of a high-end, fresh foodie lover’s paradise. A lot of my experience was found in St. Pauli, which is a budding scene for hipster chefs to spread their wings and impress the young crowd. Due to the mindful, eco-friendly ways of Hamburg, vegetarian and vegan options are often on the menu. Nothing compared to the rainbow look of the California bowl at Hatari on the Corner. Not to be confused with the other Hatari restaurant right across the street – I love the tongue-in-cheek battle between two very different restaurants. Hatari on the Corner not only has great veggie meals, but the carnivores will love the massive burgers too. Everything paired great with a cold glass of Riesling. On the other side of town is the place for pizza and well worth the hike. The Pizza Social Club is best when the weather’s nice, as the seating al fresco and open-air concept is so breezy and relaxing. Have a few different pies to share, such as the burrata or the white bacon variety. We took a long walk for pizza after a few hours of canoeing on the canals in Hamburg with Bobby Reich boat rentals. Hamburg has so many beautiful waterways lined with whitewashed mansions and endless greenery. People practically live on the water, so business has adapted to offer fun things like ‘paddle up’ coffee shops. Back to St. Pauli. Within a block or two of the Superbude Hotel were countless choices for food, it was tough to just pick a few. One night was a French affaire at Bistro Carmagnole for steak frites and a bold Cabernet. The staff were so friendly to squeeze me into a candle-lit table on a busy night and carefully explain the menu to me, filled with rich selections of roasted artichokes and braised sea bass. Down the street, I treated myself to the cool air and a sundae outside at Eiscafe Venezia – an Italian gelato gem with a friendly owner. Before leaving trendy St. Pauli, don’t miss the chance to try some cocktails and Asian-style bowls at Rice Brothers. It’s one of those welcoming places you can go alone with a book and a hot bowl of curry, or bring everyone you know for a lively dinner. Pho is fresh and delicious, as are the spring rolls. You can stick around and take one of their workshops too. They teach how to make the perfect spring roll on your own with top chefs. Once the excitement from MS Dockville died down, it was time to see a bit more of the city. Though touristy, I really enjoyed a ride on the double-decker bus to get acclimated to downtown and the waterways. Hop off the bus anytime – especially by the famous fish market. You need to visit very early on Sunday morning (or very late depending how your weekend goes!) to catch the food and music. Otherwise, stroll along the industrial canal anytime. Fresh fried seafood for lunch at the Watergate is worth it. Swing through to the train station to pick up some snacks for back at the hotel. Also, we happened to catch a big cycling race happening that day. The city center always has something going on. Where to Next From Hamburg? 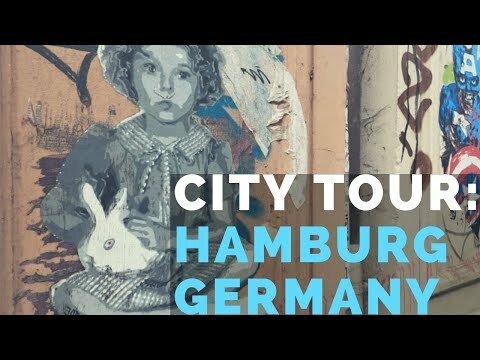 After your weekend in Hamburg, it’s simple to get to other Germany cities. The train to Berlin is less than 2 hours away by train and direct. Not to mention, the Hamburg music festival scene is not the only one in Germany. You can hop around over the summer if music is your jam and see a few more. Or, stick around and do Oktoberfest (which is actually in September) in Munich and many other German cities. If you rather head north, there are no more cities to explore – but there is the seaside. I loved a quick overnight in Heiligenhafen, which is just a few miles across the sea from Denmark. Amsterdam and Rotterdam in the Netherlands are about a 5-hour train ride away (or even quicker on flights) to round out your trip. But there’s plenty to do and see in Hamburg alone! I’m not a fan of festivals – too many people – but all the food and water activities look like a lot of fun! For so long German food was very underrated, but in the last 10 years it’s come a long way and the meals look divine! I’ve also always like the design of the hotel rooms too! I love Germany and I know how seriously they take their music festivals! I’d be curious to attend one. Even more, I’d like to stay in the Superbude Hotel and take a look around St. Pauli. I’d love to see the street art and murals. The food looks fantastic, too. Sounds like a place to keep in mind when I want to take a side trip when I’m in/near Germany next time. This one was ‘small’ too, I’d love to see some more, it was so well done! My family goes to Amsterdam all the time, so to see that Hamburg is so close is very motivating for me to visit. I am obsessed with unique street art and when I saw the woodheaded man I kinda fell in love with the place. Its nice to see what is locally available to eat, I love it when fresh fruit/veggies are available. You should! So easy on the train. Nice new city to explore! I am not into music festivals, but I would totally go there for the food! Hamburg seems to have a very diverse food scene. Besides the iconic dishes, I am particularly curious about the Asian-style bowls you mentioned. You are making Hamburg sound so cool!! I haven’t been to that many festivals, but the ones I’ve been to I’ve absolutely loved. I would definitely consider doing a little musical festival tour of Europe with a stop in Hamburg! It’s a really cool city – but not so young where I felt out of place! I really liked it. It sounds like your music fest trip to Hamburg was a big success all the way around. How well a festival makes ALL the difference in terms of whether it’s a pleasant experience. Superbude looks like a great place to stay. The only way I do hostels these days is in the private rooms — and they can be a great way to drop the cost of a trip. The music festival sounds fun, Hamburg looked incredible. There was so many fun day trips and good things to eat going on. I think I would go hog wild on the gelato. I have never been to Hamburg but of course the festival looks amazing. All festivals are, I can get behind the more casual vibe tho. Also its so so cool that people can canoe and kayak and SUP down the canal in the middle of the city. I feel like that would be a surreal experience. It was really nice actually to just throw jeans on and see some great music!